Veterinary groups have criticised the federal government’s plans to commence live cattle exports to China. Vets Against Live Export (VALE) said the journey by sea to China is about 18 days, equivalent to the journey to the Middle East, a distance they deem unacceptable. The organisation is also concerned about animal protection laws in China, and said Australian animals are likely to be handled and slaughtered in a fashion that would be unacceptable at home. VALE believe animal welfare is best served when animals are slaughtered as close as possible to the point of production. “The history of what has happened to Australian cattle exported live tells us that the outcomes are not likely to be acceptable,” VALE spokesperson Sue Foster said. Foster said the Australian Bureau of Agricultural and Resource Economics and Sciences (ABARES) report from the September quarter of this year indicates that local beef cattle slaughter will decrease by five per cent, primarily due to increased live export demand. She added that the demand for both domestic and export meat (including demand from China) would remain strong, however direct competition for slaughter animals being sent to live export would result in a fall in beef and veal exports. Foster concluded that increasing local processing of cattle and exporting meat in response to demand is the rational and ethical course of action. 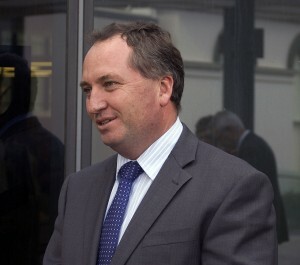 A spokesperson from the office of Minister for Agriculture Barnaby Joyce said live exports are an important, ongoing trade for Australia, contributing to the economy and supporting regional communities. “The livestock export trade contributes to the food security of people in several countries across the world,” the spokesperson said. Minister Joyce’s office claimed the Exporter Supply Chain Assurance System (ESCAS) provides assurance that international animal welfare standards are being met in 18 countries, training over 7000 people in animal handling and husbandry skills. “While it is difficult to measure welfare outcomes in other countries our information shows that ESCAS has lead to improvements in animal handling and slaughter practices,” the spokesperson said. “The current system is designed to ensure industry minimises the risk. The spokesperson added that the federal government has been working with the Chinese government’s veterinary authorities to reach agreement on animal health certification requirements. “I expect exporters will soon be working with importers in China to implement the ESCAS and establish supply chains that meet requirements,” the spokesperson said.